Listen past the unique otherworldliness of Gabor Szabo’s music and the most striking and ultimately memorable aspect of it is the guitarist’s innate and uncanny ability to tell a story. Whether crouched in performance or through the product of his too-brief recording career, Szabo never failed to weave hypnotic lines of feeling into a rich, well-considered tapestry of sound. Gabor Szabo takes listeners on journeys that traverse the unusual and unexpected. But he never burdens flights of fancy with flurries of notes, clusters of chords or parabolic equations. Without ever uttering a single word, he spins dramas of daring and tales of adventure that charm and entrance, beguile and bewitch, often in little more than the space of a few minutes. His music couples unusual and poetic passages with dramatic flourishes and third acts worthy of the great writers in literature and music. Whether it’s the short stories he tells or the odysseys he seemingly acts out, his music has a beginning, middle and a most rousing end. It tells of notes chosen for a reason, which is easily attributable to Szabo’s gypsy forbearers and his first influence, Roy Rogers (believe it or not), and a brilliant use of space (certainly influenced, musically, by Miles Davis, and artistically by the painters he loved so much). It’s not surprising that Gabor Szabo was also a painter, which he professed to be his first love. It’s in his sound. It is a deeply human sound. And it’s not always pretty either. Szabo’s stories tell of the demons he battled and the struggles he’s fought – not always so successfully. Edges are rough. Corners are jagged. Straight lines and predictable patterns are nearly always broken. Sometimes there is a downright discordant or jangled/mangled note that lets you know you’ve turned down a road you may have never been before. This was Szabo’s way of telling a story. It’s unpredictable, not always pleasant and set him even further apart from any other guitarist. Indeed, Szabo hated “easy listening” music and his own music reflects this – even when it’s pretty to listen to. It’s never merely moody, never buried in the background and distinctly not the kind of music that makes for good cocktail cacophony. Szabo’s music commands attention. There is always a sense that Gabor Szabo believes in what he is playing. He once said “(t)he artist’s duty is to reflect the times, to react to them and to communicate it to the people.” Whatever bag he’s in – jazz or whatever “not jazz” music is the flavor of the day – he’s simply telling stories. The gypsy. The spellbinder. The sorcerer. The great storyteller. This is Gabor Szabo’s magical connection to me and, I suspect, to many of the people who still feel his presence in the world today, more than a quarter of a century after his death. His stories bounce around in the mind long after they’re heard and the words, or the notes, write themselves upon the soul. 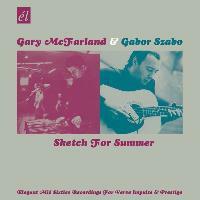 Doug Payne has chronicled the musical lives of Gabor Szabo, Gary McFarland and others on his Sound Insights website at www.dougpayne.com.